A new report issued by the Minnesota Department of Health estimates that removing lead from drinking water in Minnesota could cost $4 billion dollars over two decades, but they also note that the benefits of removing lead, a harmful neurotoxin, could be double that amount. The report estimates that there are approximately 100,000 old lead service lines in use throughout Minnesota. Replacing these lines is will be no small task especially given the lack of information on where these lines specifically exist. An article published by the Star Tribune about the report notes that part of the high cost is the complexity involved in surveying private homes for lead plumbing: "Lead service lines and plumbing fixtures inside the home are the most significant source of lead in public drinking water. A huge challenge in removing them is that the water supplier owns part of the pipe, and the property owner owns the stretch running into the building. The dividing line on ownership is typically somewhere around the curb." There is also reluctance from many homeowners to take on the cost of replacing lead service lines which can cost anywhere from $2,500 to $8,000 per line. "To help property owners pay for removing their lead pipes, officials are eyeing the Drinking Water State Revolving Fund. The fund, a mix of federal dollars, state money and loan repayments, is jointly run by the Health Department and the state Public Facilities Authority. The two agencies are discussing how the funding might be transferred to cities and utilities that would devise ways to provide it customers, via grants or low interest loans, for example." Lead exposure is a significant health concern as it can cause cognitive damage, especially in young children under the age of 6. There is no safe level of lead in drinking water. Have you ever had your water tested for lead? Even newer homes can contain service lines, pipes, or fixtures with small amounts of lead. Contact us for more information about lead testing. We can get you a sampling kit and help you determine what your next steps are if you do find lead in your drinking water. 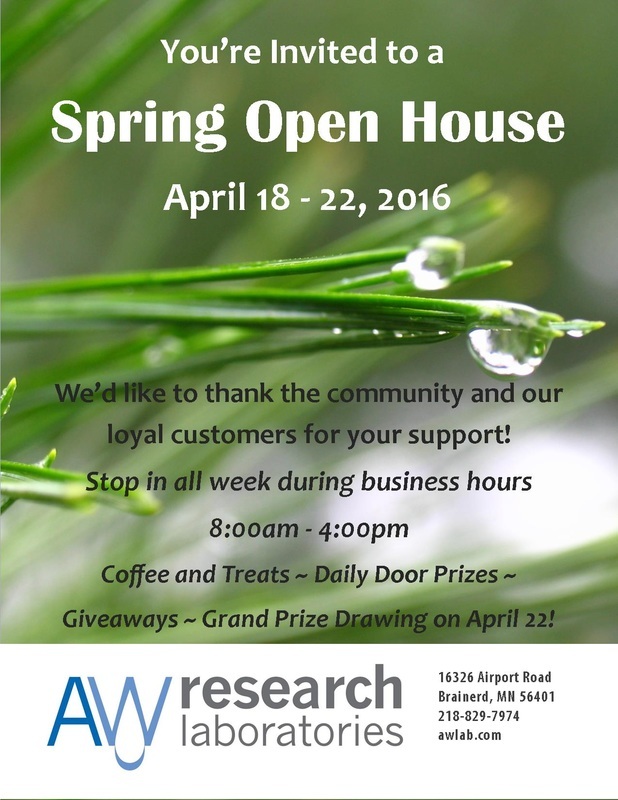 Click Here to view the original article on the Brainerd Dispatch's website. In the Brainerd lakes area's corner of the world, water is a way of life. At a laboratory near the Brainerd Lakes Regional Airport, analysis of what that water contains is the focus of three women. Certified by the Minnesota Department of Health, A.W. Research Laboratories offers testing of drinking water, industrial and municipal wastewater, stormwater, groundwater and surface water in lakes and rivers. The water is tested with techniques ranging from hands-on sampling and lab work to high-tech analysis with complex machinery. Sara Ahlers, Stephanie Kuesel and Sarah Fogderud share ownership of the lab, acquiring it jointly following the death of its founder, Alan Cibuzar, in 2014. "When you're an owner, you just look at everything from a totally different perspective," Fogderud said during a July interview. "I'm really thankful that I have two other people to share that responsibility with. All three of us can kind of take on the different pieces of that ownership responsibility." Fogderud, 31, is the most recent addition to lab team, joining in 2008. Originally from Bismarck, N.D., she earned a biology degree from Gustavus Adolphus College. Her primary duties are working directly with clients and keeping the books. Ahlers, 43, has served as laboratory director for 17 years. She hails from Red Lake Falls and attended the University of Minnesota, where she earned a degree in biochemistry and molecular biology. As laboratory director, Ahlers oversees certification and quoting for clients, which include private homeowners, municipalities, lake associations, state agencies, septic inspectors and real estate agents. Kuesel, 39, is a 15-year employee of the company. She is from Little Falls and earned degrees in water resource technology and environmental resources from Vermillion Community College and the University of Minnesota. Kuesel's role is as laboratory manager, overseeing the day-to-day testing and management of lab resources. Together, the three are continuing the legacy of one of the first state-certified water labs in Minnesota—but not without Cibuzar in mind. "He worked 24 hours a day," Ahlers said. "He was a great teacher." A.W. Research was born in the back of a downtown Brainerd shoe store, owned and operated by Cibuzar's father, Paul. It was in this space where Cibuzar began his work on remote sensing and spectral imaging—work that would later bring him international recognition in the field of environmental remediation. Cibuzar's imaging work—which involved photography from an airplane to locate pollution sources—was the first division of the company. His love of Minnesota lakes led to the pursuit of the water testing and consultation aspects of the business. Cibuzar moved A.W. Research to a double-wide modular home on the airport grounds in 1997, where it's been ever since. Ahlers said Cibuzar was in the process of planning his retirement from the business at the time of his sudden death from a heart attack. "He really wanted to give the company to us, to let us take it over at that point," Ahlers said. "We had been working with him a couple years to try to purchase the company." The three worked with Cibuzar's wife, Shellie, to complete the ownership transfer. The business shifted focus away from remote sensing, a passion of Cibuzar's the new owners did not feel comfortable pursuing. But evaluation of the safety of drinking water and wastewater, and the health of groundwater and surface water, remains the focal point of the lab. When it comes to drinking water, tests conducted in the lab can confirm the presence of coliform bacteria, nitrates, arsenic, lead or copper—all of which may cause either immediate or long-term health effects. Kuesel said municipal water systems are required by law to be tested monthly, but for those connected to private well systems, testing is up to the individual homeowner. Oftentimes, this means testing may not be completed for many years at a time. "A lot of people don't really think about their drinking water until they're selling their home and are forced to test it," Kuesel said. "They should be testing it once a year." One contaminant that appears more widespread than initially understood in the lakes area is arsenic. Through its testing of wells throughout Crow Wing County, A.W. 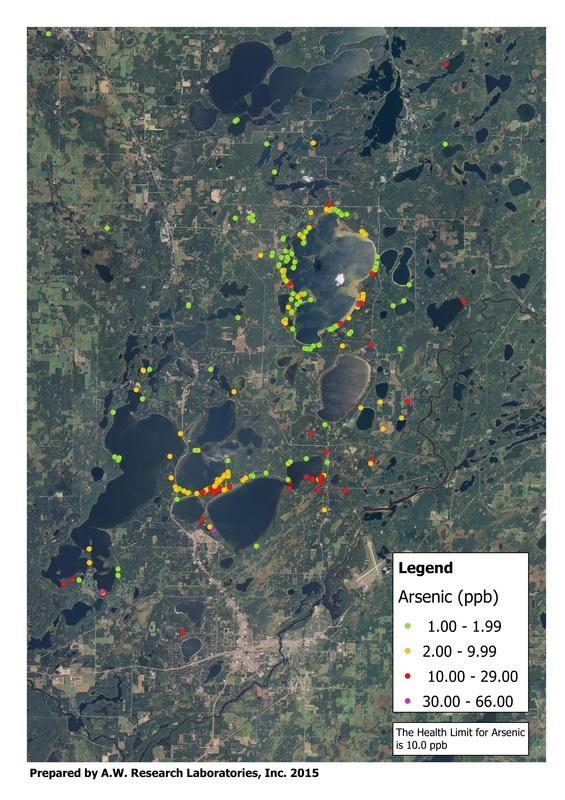 Research has amassed dozens of results indicating arsenic levels in many private wells exceed the federal health limits. Arsenic is odorless, tasteless and is known to be harmful to human health, depending on the chemical form, dosage and length of exposure. It is a chemical element that is part of the Earth's crust and naturally occurs in soil and rock. According to Minnesota Department of Health, arsenic can dissolve from the soil or rock into groundwater, and almost all sources of arsenic in well water in Minnesota are naturally occurring. Arsenic is present in the environment from human applications as well, including from its use in pesticides and treated wood products, although these uses are in decline because of health concerns. There is evidence people who've consumed arsenic at levels of 100 parts-per-billion over an extended period of time can develop diabetes, nervous system problems, several circulatory diseases and high blood pressure. Studies have also linked long-term arsenic exposure to certain types of cancers, particularly of the lungs, bladder and liver. Evidence of health problems at even lower exposures, however, prompted the federal government to change the health limit from 50 ppb to 10 ppb in 2001. One way for affected homeowners to combat arsenic contamination in wells is to install a reverse osmosis filtration system. Homeowners would not know it was there, however, if it weren't for water testing. And the testing completed by A.W. Research is different than that of some professional water treatment companies. Those tests typically identify iron, hardness or tannins, which although sometimes annoying, do not pose health risks. "There are state and federal laws for doing these tests," Ahlers said. "All of us who are here are trained on the testing that we're doing." One way the owners are helping people remember to test their wells is through reminder cards. Three years after testing, homeowners receive a postcard suggesting they re-test their water. The process for initiating testing is not difficult—homeowners are provided bottles from the lab, which they fill from the tap and return. Each sample is assigned a unique number and undergoes the tests requested by the customer. The safety of drinking water and the health of groundwater and surface water in the lakes area are closely linked—after all, these are the sources from which drinking water is acquired. Because groundwater is so close to the surface in central Minnesota, it's essentially the same water as is found in the lakes, Fogderud said. Fogderud works closely on the lakes program, which involves partnerships with lake associations, watershed districts and other local units of government to sample surface water. The sampling is used to develop monitoring programs, identify environmental trends and make recommendations on water management. 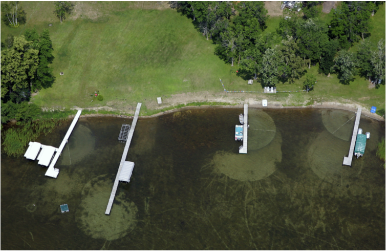 One of the ways to monitor lake health is with the Carlson Trophic Status Index, which allows comparisons across lakes for the presence of total phosphorus, chlorophyll and water clarity. Fogderud said for the most part, lakes in the Brainerd area are faring pretty well—particularly in comparison to lakes in southern Minnesota, of which many have been recently deemed impaired. "They still have a chance if we're careful about how we develop around them," Fogderud said. "The biggest thing with lakes is just the way we treat them, with how we live along the shoreline. ... People come up here and buy a lake cabin ... and they have their nice suburban lawn. That's great in a city and in a suburb, but you can't transport that up here and expect everything to work out OK. When you're living on a lake, you're part of that ecosystem, so it's people being willing to give up some of those aesthetics." Giving up on those aesthetics means allowing natural shoreline to dominate, refraining from fertilizing near the shore and maintaining septic systems to ensure they're not leaking into lakes. Fogderud said she believes awareness of the importance of co-existing with the lakes is increasing among people, and it's important to her to be a part of that. "I really like working with the people that come in. Just helping them, whether they have a concern about their drinking water, or a concern about their lake, just helping them to get the information they need to make the right decisions," she said. "I think it's really empowering for people. I like to be that resource, that place where they can come with questions. And if we can help, we'll help." A new chapter for A.W. Research Laboratories is on the horizon, as officials at the Brainerd Lakes Regional Airport look toward growth. The plans call for the lab to vacate its present location next year, to allow NorthPoint Aviation to leave the terminal and expand a nearby building. Ahlers said they are working with airport staff to see if another location of the property would work, but otherwise, they intend to stay in Brainerd to remain the most accessible to their customers. No matter the physical location, the faces of the lab say they will continue keeping the proverbial finger on the pulse of the lakes area's water health. Interesting fact: The company has its origins in 1972 in the back of Paul's Shoes in downtown Brainerd, where a young Alan Cibuzar began his work in spectral imaging and remote sensing. A.W. 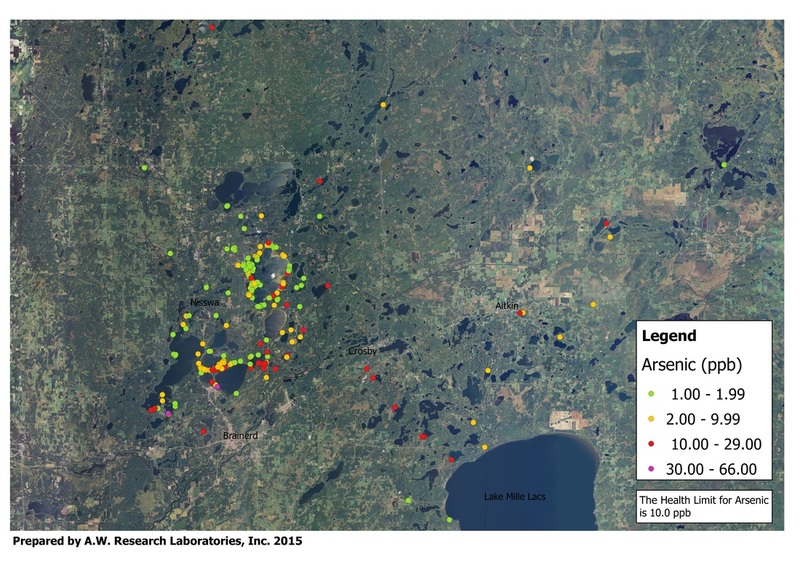 Research Laboratories has been working with local homeowners and lake association members to document the arsenic concentration in groundwater throughout the Brainerd Lakes Area. Our most recent maps include sample results from 2014 and 2015. The red and pink dots indicate areas where arsenic was found over the health limit of 10.0 parts per billion (ppb). Click here to learn more about arsenic testing. 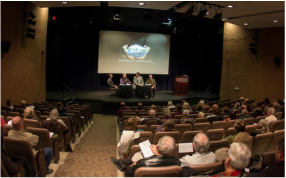 ​The Rosenmeier Center for State and Local Government will hold a public forum on an in-­depth and focused look at the present and future of Northern Minnesota water and ways we can keep it as pure and pristine as it is now. The forum will be Monday night, October 5th at the Central Lakes College Chalberg Theater. 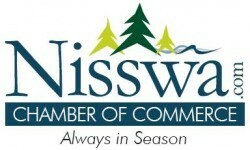 The presentation will begin at 7:00pm. The forum, titled "Water Conservation in the Mississippi Headwaters: The latest science, methodology and collaborations," is presented by Todd Holman, of The Nature Conservancy, and Dan Steward, of the Board of Water and Soil Resources. Increasing the impact of the Center through partnerships and cooperation with other groups and similarly proposed organizations. Gordon Rosenmeier was born in Royalton, Minnesota in 1907 and resided in Little Falls from 1912 until his death in 1989 at age 81. He was a graduate of Little Falls Community High School, the University of Minnesota, and Stanford University Law School. He also studied at the University of Chicago. In 1932, he took over the Little Falls law practice of his father, Christian Rosenmeier, and maintained that office for the rest of his life.